Produce labels or forms with fixed or dynamic text, pictures & barcodes. Tattoo Enterprise Edition 5.3.0.8 is inventory & barcoding software developed by Integrated Software Design. 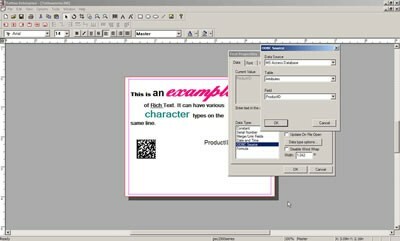 Whether you are designing and printing labels for internal use or for your customers, Tattoo ID Enterprise Edition lets you produce labels with fixed or dynamic text, pictures and barcodes. Dynamic data can come from a wide variety of sources, including your companys database. Create labels for FDA, OSHA, HIBCC or AIAG compliance, inventory, shipping, or tracking. Control label design at a central location, print remotely, throughout your company. Tattoo Enterprise Edition 5.3.0.8 supports different languages (including English). It works with Windows 98/XP/Vista. Latest Tattoo Enterprise Edition 5.3.0.8 does not contain any spyware and/or advertise modules, allowing installing it with no worries concerning valuable information loss. Our website has thoroughly tested business product Tattoo Enterprise Edition 5.3.0.8, written the review and uploaded installation file (32847K) to our fast server. Downloading Tattoo Enterprise Edition 5.3.0.8 will take several minutes if you use fast ADSL connection. Design professional labels with text, pictures, shapes & bar codes.